The Séjours & Affaires Park Republique extended stay hotel, close to the Auverne, Puy de Dôme, and Vulcania (European Park of Volcanism) Volcano Natural Parks, offers an ideal solution to your accommodation needs during your business or personal travel. 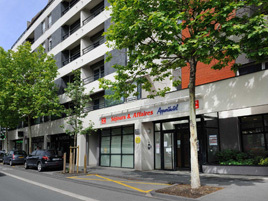 The aparthotel is on the prestigious Avenue de la République, near the Marcel Michelin stadium, a few minutes away from the town center, the train station, and the main highways. The tramway and many buses stop near the aparthotel. Take advantage of bright apartments that include a fully-equipped kitchen, an office area, a free high-speed internet connection, and a flat-screen television. - Monday to Thursday: 07:30 to 12:30 and 13:30 to 19:30. - Friday: 07:30 to 12:30 and 13:30 to 18:00. - Week-end and public bank holidays: closed.